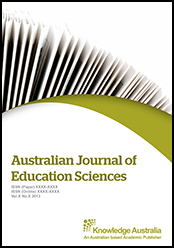 The Australian Journal of Education Sciences(AJEDU) is an international peer-reviewed academic journal dedicated to the latest advancement in this area. The goal of this journal is to provide a platform for Education and Learning Science researchers, policy makers and academics all over the world to promote, share, and discuss various new issues and developments in related problems. All manuscripts must be prepared in English, and are subject to a rigorous and fair peer-review process. The journal is published both in online (open access) and printed versions (upon the request of authors, readers and institutional subscriptions). The scope of the journal includes (but not limited to): technologies in education, Educational research, Epistemology, Inquiry-based Science, Education Standards. Pedagogy, Physics education research (PER), School science technicians, Science, Technology, Society and Environment Education, learning process, resources and case studies. There's no deadline for academic article submission and all the submissions are subject to software plagiarism checking and peer-review.